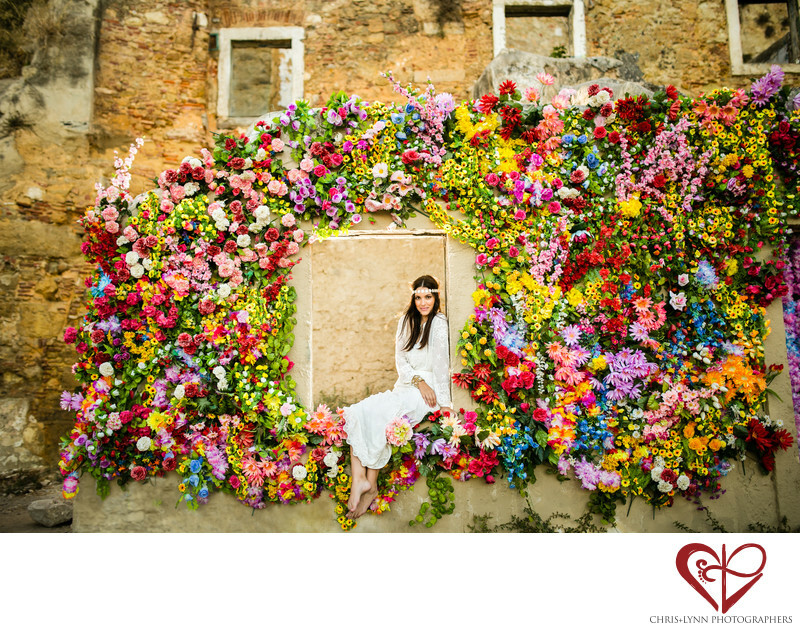 A wall of flowers in the midst of ruins was the perfect location for our bohemian bridal shoot! We discovered this location at the very end of a long day of scouting - a reminder to always look around the next corner! We liked the contrast of the textured stone wall in the background with the bold colors of the floral foreground. To separate the bride from the background, we added a rim light with an off-camera Canon EX600-RT Speedlite flash triggered by a Canon ST-E3-RT radio transmitter mounted on our Canon 6D full-frame camera body. Creating a portrait that combines the beauty of the bride with the beauty of the location is always one of our must-have shots when photographing destination weddings. In travel photojournalism, we call this 'capturing a sense of place', and it is something we always strive for in our destination wedding photography. Our bride was beautiful, and we of course captured many different close-up bridal portraits to show off that beauty. But the images that are our favorites are so often environmental portraits such as this one that require us to take a step back and take in just a bit more of the local colors and scenery. 1/320; f/1.8; ISO 160; 35.0 mm.